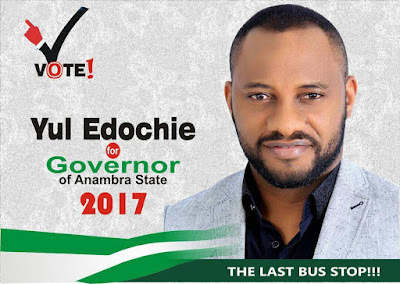 Nollywood Actor Yul Edochie who had earlier declared his interest to run for Anambra Governorship election come November 18 2017 has released his vision & plans for Anambra state if elected as Governor. My vision is to make Anambra state THE LAST BUS STOP for investment, tourism and opportunities. A state where dreams come true, where people assist one another to progress. An Anambra where everyone is happy. My mission is to create equal opportunities for every Anambra indigene, create a conducive state for everyone to live in and invest in, eradicate poverty completely and make Anambra state the best part of the world to live in. Truly THE LAST BUS STOP!! !